Falcons are amazing predators and in my opinion the most spectacular aerial predator in the world. They are not the strongest amongst birds of prey, but their hunting tactics are truly remarkable. There is a reason that fighter jets are designed after falcons. It is not just the amazing speed, but also the way they are able to turn at g-forces that would kill a human being. There are many types of falcons throughout the world and North America. The most commonly found in North America are the Prairie Falcon, American Kestrel, Merlin, Gyr Falcon, and the infamous Peregrine Falcon. Kestrels hunt in a different fashion and do not use diving techniques. The Peregrine is the most well known for its speed and hunting ability. In my opinion, the Gyrfalcon, although larger is as fast as the peregrine. Falcons mainly prey upon other birds, such as ducks, pigeons, grouse, etc... They fly high in the sky far above their prey and when ready to pursue, go into an incredible dive. In the dive, they turn in a corkscrew fashion after their prey. Even though the fastest way from one point to the other is a straight line, the falcon dives in this way to keep its eye on its prey. The reason is their eyes are placed more on the side of their head, instead of looking straight forward like humans. They have long narrow wings built for speed and a long narrow tail built for amazing turning capability. They strike their prey at incredible speeds in mid-air, sometimes the one strike is all it takes to kill. If not the falcon will gain altitude again quickly and strike again and again. They are also well known for chasing their prey down after the initial strike. They sometimes hit with their feet and talons open and sometimes with their feet closed making a fist. Either way is enough to make a lethal blow to its prey. The Peregrine Falcon has been documented diving at speeds at 232mph. This 2-pound bird has been known to take prey as large as a 9-pound sage grouse, the largest game bird in North America. In the falconry world, falconers breed falcons for hunting purposes. The popular Falcon to breed is a hybrid, a bird that is half peregrine and half Gyrfalcon. Many falconers like to use male birds because of their tenacity, the problem is the males are smaller than females and are not large enough to take down the popular sage grouse. This hybrid bird is perfect for sage grouse hunting, they get the large size from the Gyrfalcon and the tenacity from the peregrine falcon. These hybrids are usually the size of a female peregrine but have the personality of a male. The peregrine falcon seemed to be doomed to extinction because of a chemical pesticide, called DDT that farmers used on their crops. Finally, the US banned DDT and since then the peregrine, along with many other species of birds have made a full recovery. The peregrine is common and will even build their nests on ledges of a giant building that resemble a cliff in big cities. Watch high in the sky for this amazing predator that is truly the jet fighter of the bird world. "Look up! It's a bird.....It's a plane......It's The Peregrine Falcon!" Sounds familiar, doesn't it? Superman was a fictitious character, as was Humphrey Bogart in the Maltese Falcon, and although very popular and very entertaining, was no match for a real, super bird called the Peregrine Falcon. This creature is one of the most powerful and fast-flying bird there is. The Peregrine Falcon probably has one of the longest migrations of any bird in North America. Covering as much as 15,500 miles in one year over two different continents, spanning North and South America, hence the meaning of the falcon's name, "wanderer" or the scientific name of "Falco pereginus." This is an incredible flier! You will find that these Falcons are averaging 25-34 miles per hour in traveling flight and as fast as 69 miles per hour in direct pursuit of prey with a hunting stoop from heights of over .62 miles! I don't even know if a Geo Spectrum could cruise at that speed. After reaching speeds of 200 miles per hour, they will drop toward their prey and kill it by biting into the neck of a passing songbird, duck and occasionally bats. OUCH!!! These falcons are so acrobatic, they can even catch their prey in mid-air. What a feat!!! 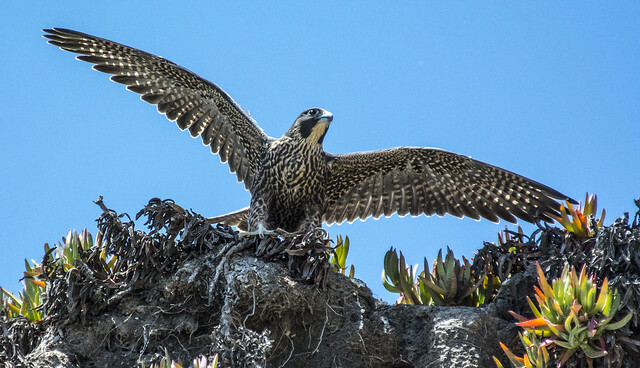 The Peregrine Falcon's habitat is comprised of every continent in the world save Antarctica and on many oceanic islands making them one of the most widely distributed species in the world. What proof is there that shows the durability of this bird? It has been proven that the falcon can survive in a wide range of areas of habitat to include: urban cities, deserts, the tundra and the tropics. They remind me of people who live in the state of Maine and then travel to Florida in the winter because the Peregrine Falcon will migrate super long distances from where they reside in the winter, to their summer nesting areas on the globe. Who knows? They may have even bought into "Time Shares." Have you ever been in a big city and see an image of a hawk or eagle on a skyscraper? There is a stark parallel to real habits of these falcons that are illustrated high atop those buildings. For instance, Peregrine Falcons have done a great job in adapting to living in many of our cities in the United States of America. They have the ingenuity to make use of tall skyscrapers and buildings that have suitable ledges for nesting. They display their desire for cuisine variety in their meals by making use of their neighbors, the pigeon, and starlings, in the cities for their food supply. What a tasty and scrumptious treat for these Teflon birds. These Peregrine Falcons are very intelligent and trainable also. This has always been one of the most prized birds amongst men. People have used and trained these birds for hunting, as well as message carriers. In 1940, the Federal Government issued an order to cull these Peregrine Falcons bringing about the death of 600 birds. One reason may have been because in the second World War, the armed forces used over 200,000 homing pigeons as message carriers which were also on the menu of these falcons. This was part of the reason for the decline in these fabulous birds. Populations began a rapid decline from 1950 - the 1970's because of DDT (Dichloro-diphenyl-trichlorethane) poisoning. This poisoning effected The Peregrine Falcon eggs, causing thinning and making them susceptible to breakage during incubation. Not to mention other birds of prey such as the Golden Eagle and the Great-horned owl would occasionally kill peregrine falcon chicks. At this point, they made the Endangered Species list and by 1970 extensive efforts were made to reestablish the birds' population. Man driven efforts to breed the Peregrine in captivity began to make a difference to this almost "down for the count" bird. This is why we consider them the "Teflon" bird of prey. They have made an awesome come back. By 1999, the peregrine falcon finally made it off the Endangered Species list. As we have seen in part, with the aide of man the peregrine falcon almost became extinct and with the aide of man the peregrine falcon has made a tremendous comeback. Let us all be aware and continue to be part of the solution in taking part in the preservation of this "Teflon" survivor. Watch them soar, watch them hunt, watch them perch in their natural habitats. The history of this falcon is one you can share with your children and grandchildren for ages to come. Gary Freeman. I am a wildlife enthusiast living in Wyoming. I want to get the word out about wildlife preservation and natural insect control. The peregrine falcon is the best-known falcon and most widespread in the world. However, if you travel to North Dakota, you won't see many and you will not find any at all in Antarctica. This falcon was on the endangered species list back in 1970 because of a problem with eggshell thinning that was caused mainly by use of the pesticide DDT during the 1950s and 60s. It took biologists 20 years to figure out that the pesticide used to protect plants from insects was the problem affecting these birds and other animals. Small animals ate the plants contaminated with the pesticide, and when the peregrine falcon hunted those animals, the infected flesh poisoned them. The chemical even changed the behavior of peregrine falcons in that it made them stop caring for their young. The federal government banned the use of DDT in the United States; however, the recovery process took a while because the chemical residue remained in the environment. Other countries which are home to peregrine falcons still use DDT, and that, along with trapping and shooting by poachers, still cause the bird's population to decrease. Today the endangered list still includes the peregrine falcon, and they are gradually increasing in population. The peregrine falcon is not a very large bird; it is about the size of a crow. It is identifiable by its dark blue to slate-colored back and its white throat. It also has a black teardrop right under its eye and small black sideburns. Peregrine falcons hunt at dawn and dusk; they will prey on ducks, pigeons, other birds and small mammals. They search for their prey from the air, and when they spot something to eat, they attack, making a sharp loud territorial call. They will swoop down at an incredible speed, up to 200 miles per hour, which makes this the fastest creature on earth. When they target their prey falcons use their talons to strike a severe blow to the creature to eat on the spot or to carry away to their eyrie. Peregrine falcons are normally cliff dwellers which build their nests far out of reach of people. However, you can find some in cities on top of high buildings. Researchers who study these birds help them with city nesting; they supply certain buildings with leaves and other materials which the Falcons can use. The peregrine falcon can be found all over the world. Just look out for a bird the size of a crow with dark sideburns, yellow legs and pointed wings when in flight. Hunting permitted with a camera only.